I remember as a kid, my friends and I would always be “tinkering” with our BMZ bikes. Taking things off, putting things on, getting it just right… Then came motocross, the same thing would happen… Change this, change that, all in the interest of getting what you wanted. I remember installing a CR80 front end on my XR80 and lowering the rear. I loved the way it looked and felt and more importantly, I was the only one in town with that setup. It was original and it was cool. Flash forward to the future and that passion for customizing and having things my way has never gone completely away… Sure, it was perhaps repressed to a certain extent because of life and conformity, but there is something about modifying your machine that is just so satisfying, I had to do it again. 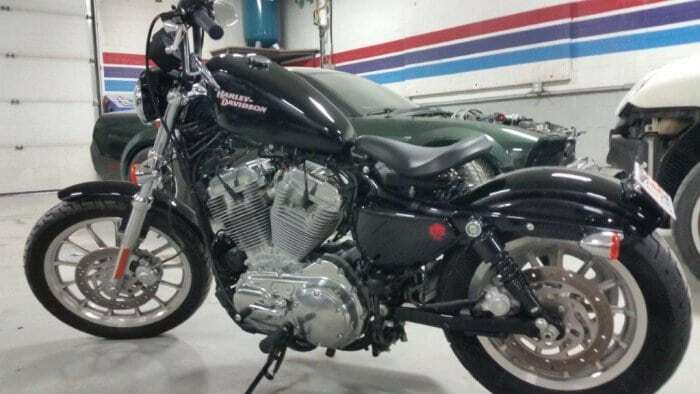 I set out to find a project and found a 2008 Harley Davidson Sportster for sale at my local Harley Davidson Dealership. 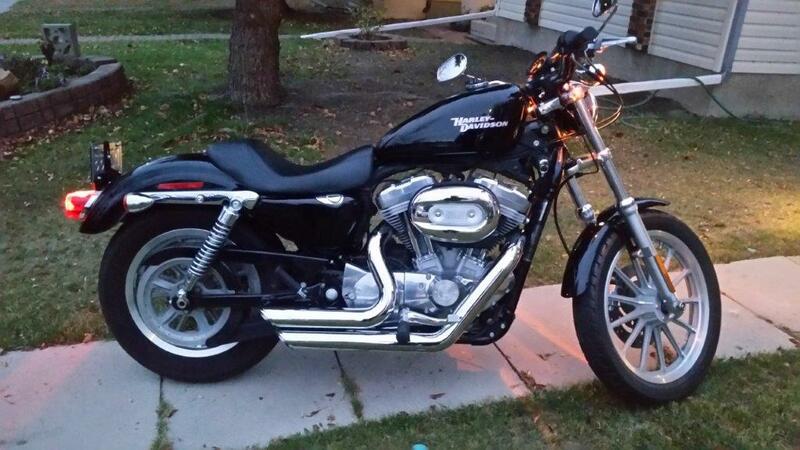 I had sold my 2004 Sportster earlier in the year to purchase a 2007 Harley Davidson FLHTCU. I love my touring bike, but I missed my Sporty… The price on the 2008 was right and I know that this would make an excellent platform for a bobber. 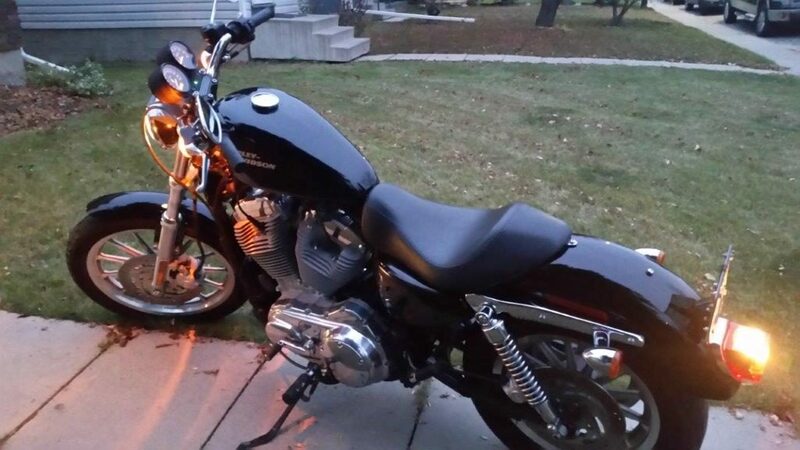 I had the dealership install a set of Vance and Hines Short Shot pipes and brought it home. My winter project was starting and I was excited at my first attempt at modifying a motorcycle in a long time. 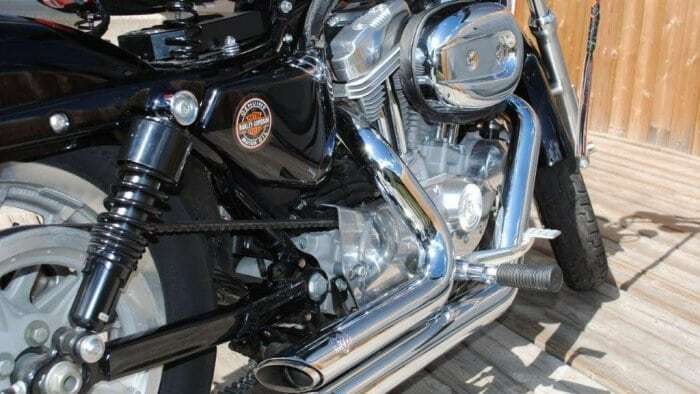 A 2008 Harley Davidson XL883. A bare-bones, black, solo seat, completely stock bike (With a new set of very loud pipes). Sportsters have been around since 1957 and have proven to be a very versatile platform that is still in production today. They are an awesome city bike. 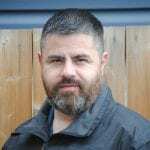 They have good power, they handle well, they are quite nimble to navigate potholes and manhole covers and they have the classic Harley Davidson V-twin rumble. 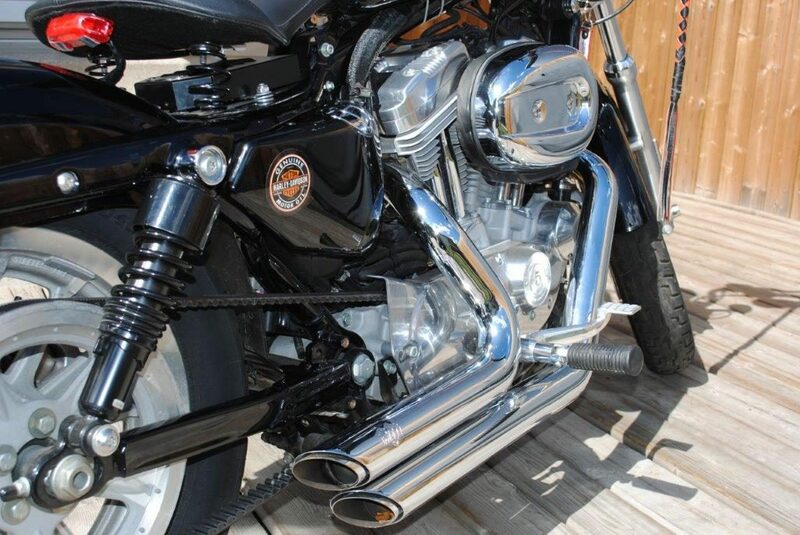 The 2008 Harley Davidson XL 883 features a fuel injected 883 cc (54 ci) v-twin with 2 valves per cylinder, a 5-speed transmission and a final belt drive. I took the Sporty out for a test drive and realized right away why everyone should have one in their collection. Compared to my 2004 that had bar risers, forward controls, and a carburetor, the 2008 had no risers, had mid-mounted controls and is fuel injected. I instantly remembered how nice it is to ride a Sportster in the city. You can lean on this bike, it’s incredibly nimble. The power to weight ratio of the Sportster is just right. In its stock form, it is not a speed demon by any means, but it gets around without any trouble especially with fuel injection as opposed to the carburetor. The bike is very well balanced and does not give you the feeling of instability. I honestly did not think that I would like having mid-mount controls and was thinking of changing them right away. I am glad I didn’t. Having the controls right under your legs allows you to tuck in your knees and exert even more control on the bike. The seat felt high and the handlebars felt low, the stock exhaust was almost silent… This would not do. The very first modification that was done to the bike was to get the dealer to install a set of Vance and Hines Short Shots to the bike. What a difference that made. I took the Sporty home once they were installed and there was no mistake that this bike had a new voice, and it was loud! I was almost regretting installing the short shots as the sound coming out of them was actually hurting my ears with a half helmet on. My friend Rob at Divita Auto Designs in Calgary was gracious enough to offer me a section of his shop to work on my project during the winter as i do not have a heated shop at home. The first thing was to dismantle the bike and start working on the modifications. I started by removing the seat, the rear fender, the rear shocks, the handlebars, the front brake line, the front clutch cable, the ECM and the cover on the belt. With everything removed, the first thing to get replaced was the handlebars. 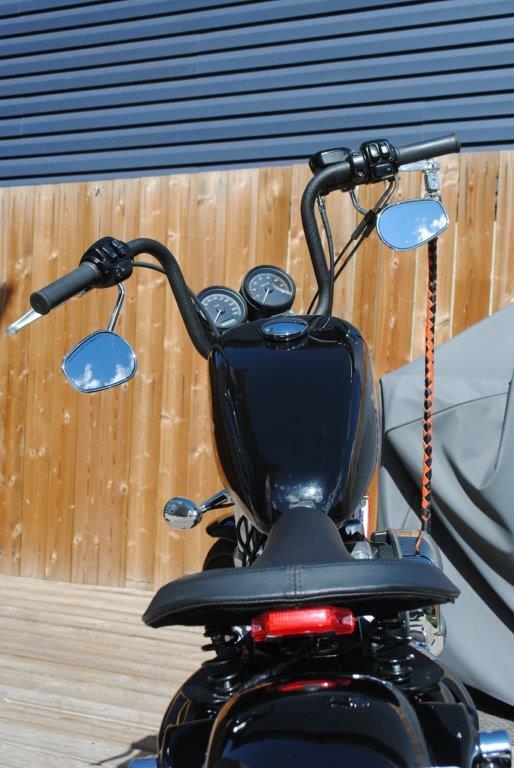 I installed a set of mini apes off of a Harley Davidson Street Bob. The height was just high enough to raise the profile of the bike and low enough to ensure that I still had circulation in my arms and hands when riding. This required changing out the front brake line and replacing the wiring to the handlebar controls. The clutch cable was long enough and did not need to be replaced. I removed the chrome visor on the headlight and got it painted black. The next thing was to re-route all of the cables and tuck them under the tank. This required a set of tank rising brackets to be installed. Finally, I relocated the front signal lights using a relocation kit and mounted the mirrors upside down. With the front of the bike set up the way I liked it, It was time to move on to the rear. The cover for the belt was removed to expose the belt, at this time the rear passenger footpegs and brackets were also removed. The next step was to remove the factory rear shocks and replace them with a set of progressives. This lowered the rear of the bike by 3 inches. A fresh coat of black paint was applied to the factory chrome rear trim. The rear fender was removed to make way for a chopped rear fender. It got a coat of black paint and the wiring for the rear lights was rerouted. A new set of arms for the signal lights with embedded LEDs for the running lights were installed. The stock rear tail light was completely eliminated and a lean down license plate mount was installed on the newly painted fender. A set of LED light screws were installed to light up and retain the license plate. Last but not least was the issue with relocating the ECM. The stock fender had a hole cut in it with a plastic holder for the ECM. The new one did not. I did not want to cut a hole in the fender and have the ECM exposed, so I went with a La Rosa spring seat with a built-in box for the ECM. 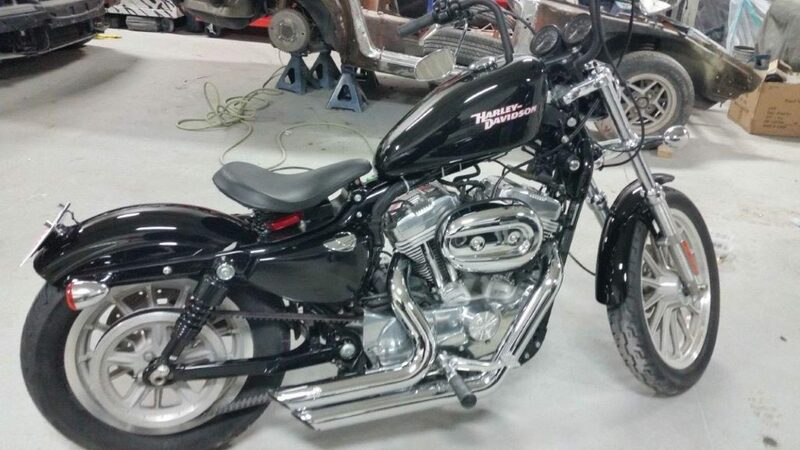 This created a simple yet elegant solution for the unusually large ECM for this motorcycle. With all of the mods done, I was longing to take this bad boy out and enjoy the fruits of my labor. 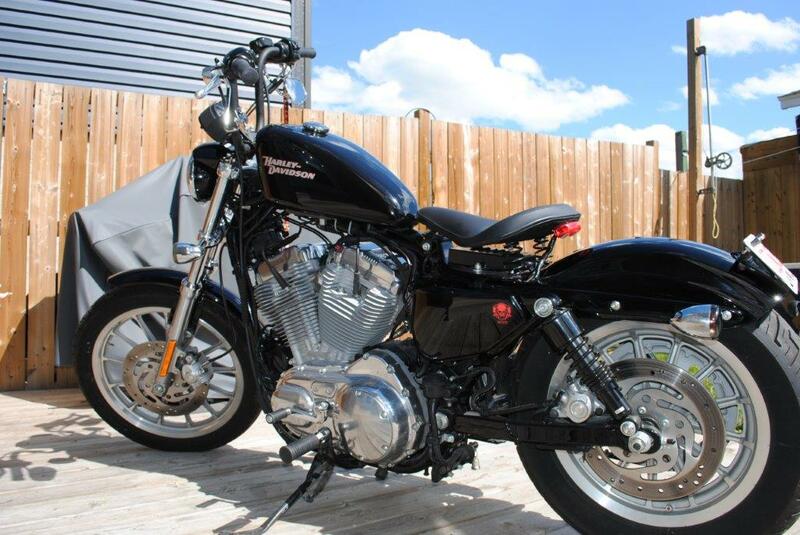 I was delighted when the weather got warm enough and the snow was gone down enough to take my new bobber for a spin. The difference was night and day in the way that this bike feels. I love the fact that the bike is much lower and the bars are much higher. It looks amazing and rides even better. The lower center of gravity makes the bike handle even better. 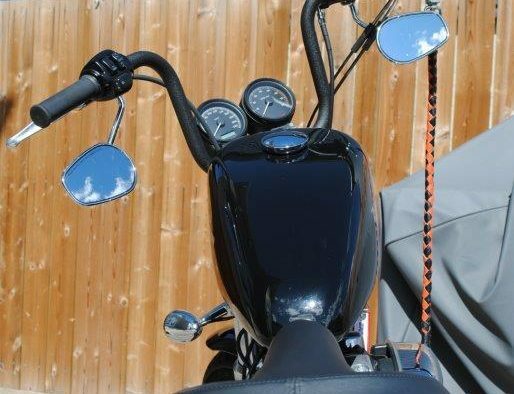 The only disadvantages to a lowered motorcycle are when you turn a sharp corner, leaning into the turn may create an issue with the pegs rubbing on the pavement. Also, when parking, the stock kickstand is a little too long and the bike does not sit as it should. Modifying the kickstand is not a big deal, I will eventually cut the foot off of the stand, shorten the stand and reweld the foot. This will eliminate the problem. As for the sparks that shoot up from the footpegs when turning a sharp corner, unfortunately, this is the reality of riding a lowered motorcycle. I found that the pipes were still too loud, so I installed a set of baffles in the Short Shots and the exhaust is now almost perfect. It still has the Harley Growl and the aftermarket pipes no longer hurt my ears when riding. Not to mention, it also means that I won’t get a ticket for riding with an excessively loud exhaust. This was my first attempt at customizing a motorcycle and it was an awesome experience. It feels wonderful to have a bike that is unique and to know that I had the pleasure to work on my own ride. The experience I gained by doing it myself is invaluable. I am confident that I can take the bike apart and put it back together without wondering if it will work when I am done. This means that I can troubleshoot problems and fix them myself. The handling of the bike is amazing, the lower center of gravity means that it is very stable on the road. I am not keen on long trips with this bike. It does not have the suspension to sustain long rides and the lack of a windshield also means that the bugs and gravel come to a stop when they connect with your face; however, In town and on less busy roads, the wind on your face is awesome. Bobbers are often referred to as bar hoppers. They are perfect for going from one meeting spot to another and shooting the breeze with your buddies, or going to a bike night to mingle with other like-minded individuals with custom machines. I love taking my bobber out for a romp and the experience of wrenching on your own scoot is one that I cherish. Great looking bike. What seat did you put on?